review: The story - the search for a cursed diamond - starts in Amsterdam’s Central Station, based on clues left by a stranger known only as W.v.d.D. 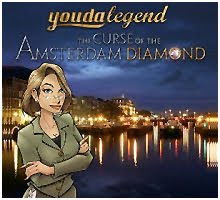 The quest takes the player across the historic city, covering famous landmarks such as the Carre Theatre, the Maritime Museum, the Flower Market and the Rijksmuseum, as well as some unknown places such as an old organ repair shop, a simply titled ‘creepy place’, and underground canals and libraries. The screens are excellently-drawn, with tasteful colours depicting various locations of Amsterdam, and are a pleasure to discover from level to level. However, the hidden objects remain at clipart level and are not relevant to the scenes except for the puzzle items. Very few HOG developers take the trouble to actually integrate the objects with the era / scene they are in, and this game also disappoints from that perspective – unfortunate, given the rest of the artwork and the overall superb production quality. On the good side, the objects are generally very easy to find and don’t require endless squinting at the screen and adjusting brightness / contrast / gamma / resolution / etc. 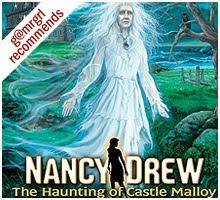 Besides locating hidden objects, which is the primary game format, the player has to do an entire gamut of puzzles, from jigsaws to sorting items, matching shapes and designs, drag-and-drop, sliders, swaps, and a few coordination pieces, where moving one part moves other parts. The puzzles range in difficulty from very easy to moderately challenging (the three keys, the flower market, the rings). There is one vague puzzle involving arranging alphabets, but that is an exception; all other puzzles are logical enough to understand and solve with reasonable ease, without consulting the hints. I liked the small but attractive design touch of diamonds getting added to the screen frame and sparkling occasionally. They also help recharge the hint compass quickly, but since the game rarely required the compass, and also because nothing was time-based, I never used that option. I collected 165 diamonds, but the stats screen (accessible from the main menu) didn’t mention the total possible, so that didn’t allow for any success rating. The dialogs moving the story forward and explaining the puzzles are short and utilitarian, but they are typo-free, and most importantly, blah-free. They keep the game moving efficiently, and are an example of how keeping it simple actually works. Another great aspect of the game is its music – high quality and relevant to every scene. Some segments are good enough to be a part of a standalone instrumental soundtrack. This is definitely one of the rare casual games where the music goes beyond being a token addition to actually enhancing the playing experience. The game is short side – my total time was only 2 hours and 30 minutes, despite taking it slow as I was writing the walkthrough simultaneously. 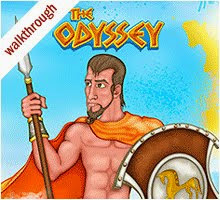 This may be because the puzzles are mostly easy to understand and solve, and for a casual gamer, this is not really a bad thing, because the aim is to relax and enjoy the game, and not crack the skull against the screen trying to figure out pre-Alexander Gordian knots. I scored 246885 points, but in the absence of a scoring rationale or comparative high scores, could not make out if this was good or bad. 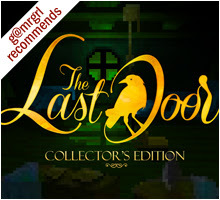 I have two reasons for not giving this game a better score: first, the absence of a clear backstory, the basic necessity of an adventure game - how did the player stumble upon this quest, and what was the big curse of the diamond? I suppose the developers thought EVERYONE already knew the lore of the Flying Dutchman (wikipedia), but completing recommended reading is not always a casual gamer's virtue, and this might leave a lot of players with a "huh, okay, so what's this about...?" 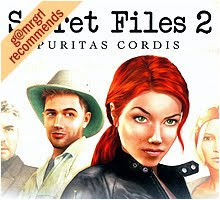 review: Welcome to the much-awaited second episode of the Secret Files – after Tunguska, spunky heroine Nina Kalenkov unravels the mystery of the Puritas Cordis, with some unexpected help from ex-boyfriend Max Gruber, a scientist. And the good news is that you don’t need to have played Tunguska to enjoy this one – it powers ahead on its own steam. 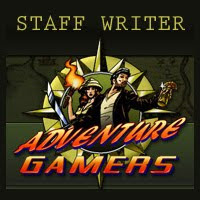 The story revolves around, well, saving the world, but with a twist. This time, Nina is trying to save the world from cultist Pat Shelton who is himself trying to save the world, though with his own twist – he wants to save the denizens of the planet, particularly those on the east coast of USA, from themselves, by well, destroying them. Not entirely an un-noble mission. Anyway, there’s also an UN convention underway about the usual suspects of global warming, melting polar icecaps, massive rogue waves and such. All these disasters, leading to an ultimate Apocalypse, have been foretold by a French cultist named Zandona around the 17th century, and through a recently discovered letter from the past, the Church is onto this plot. Thus starts the game. Nina stumbles accidentally – literally – into the story on the way to a cruise vacation in the North Sea to recuperate from her breakup with Max. Max himself stumbles in accidentally – again, literally, after an explosion no less – while helping out delectable college-buddy archaelogist Sam Peters in Indonesia. Yes, so far out that even crazy-man Shelton refuses to accept this explanation later on. But the game is full of such ironies, and the developers are not afraid to poke a bit – or lots – of fun at themselves. The game is played, at various times, as Nina, Max, Sam and Bishop Parrey. Hot-headed Nina balances the seriousness of her situations with little wisecracks, and is interesting – intelligent and assertive, and while often snarky, she stops short of being downright bitchy – unlike Sam, who in her cameo is surprisingly verbally spiteful to her native captor, swinging public opinion of her more towards annoying than cute. Max is thoughtful and easygoing, and is forgiven for wearing that waist-pouch because he is ‘incredibly handsome’ as Nina says. Practical Max spends part of the game flirting with Sam while carrying Nina’s photo in his pocket - however, the potential for a love triangle, well-hinted-at during the Adventures of Sam & Max in Indonesia, is not followed through, and Sam just disappears after a point. It’s disappointing, because there’s nothing more fun than a catfight immediately after you’ve saved the world, right? The reunion of Nina and Max is sentimental without being mushy, and when Max abandons plans to escape from almost-certain death in order to help Nina save her father, his matter-of-factness in making the decision makes you root for them as a couple. The game format is mainly inventory-based puzzles - combining items with each other or on-screen elements. There are occasional ‘real puzzles’, and these are blended well into the storyline both in occurrence and concept. 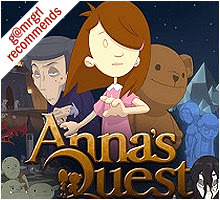 None of the puzzles are massively complicated or long – just enough to challenge without frustrating. There’s a diary that lists the game plot from time to time, and provides hints for the puzzles, besides noting down the often-lengthy clues for reference. There is a magnifying glass (the SnoopKey) that highlights action points on the screen, and prevents mindless pixel hunting or missed cues. This, a common feature of many adventure games now, is always helpful, though in this game, not really necessary. The game is overall linear and there are no chances of doing the wrong thing or dying, and amazingly, has nearly ZERO running around without knowing what to do next. The game-play is simple: the cursor shows which mouse button to press for which action. Right-clicking hastens up segments / speech. The inventory and help icons are displayed at the bottom of the screen. Saving is one-touch – even CTRL+S works! And a spectacularly efficient ALT/TAB, especially for people who read – or write – walkthroughs, and check mail often :) Grade A+ for this part of the game. The artwork is great – character movements are smooth and realistic, with little touches that elevate them beyond the usual clunky sprites. The cut-scenes are well done, some especially so, like the capsized ship, the tsunami demo and the helicopter rescue. 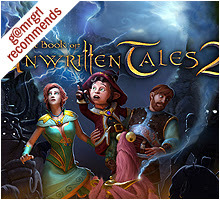 The overall experience is definitely lifted by the quality of the graphics from start to end. The weakest part of the game is its voiceovers. Nina’s is good, which is a saving grace because she talks the maximum. Max, while pleasant, sounds older and smoother than a guy in his early twenties, and Sam is okay as the bubbly girl. The supporting characters are overly theatrical for most part – the Russian guard Spivak and the French (or German maybe, tough to say) vicar Korrel, and plain irritating when it comes to Ms. Jordan and Oskar the kid. The music remains in the background, and is neither great nor disturbing. The sound effects are relevant to their scenes – functional. The subtitles are well-written, with correct grammar and zero typos, which is a rare achievement even for a lot of big productions, and particularly for those that are not originally in English. The conclusion is lucid and satisfying, and brings up one of the most fun parts of the game - the ‘Where are the now?’ sequence at the end – cleverly done. And yeah, the scoreboard listing some cool stats – apparently I walked 6040 metres, played for 724 minutes (I was writing the walkthrough at the same time and didn’t refer any myself) and consulted the help 104 times – AFTER saying in the review that it wasn’t really needed for experienced gamers. Oh well... I know the end-game said that while no animals were harmed during the making of the game, the developers ended up in mental asylums, but I’m taking hope from the fact that they are on their way to recovery, because Secret Files definitely needs a 3!